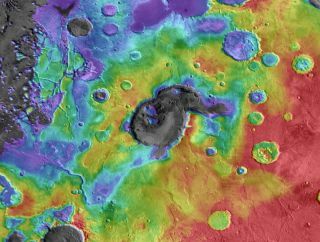 By examining an extremely old part of Mars called the Arabia Terra region, scientists have found what could be the remnants of a supervolcano — the unofficial way to describe a huge, explosive volcano that produces more than about 240 cubic miles (1,000 cubic kilometers) of volcanic material when it erupts. This image shows a 3-dimensional view of Eden Patera looking toward the east. Color image data from the High Resolution Stereo Camera (HRSC) were draped over digital topographic data from the same instrument. Michalski's study suggests that the layers of material could have been deposited after the explosive eruption of Eden Patera — which scientists think erupted at least three times — or possibly other supervolcanoes. This image shows a high-resolution view of layered materials and collapse features on the floor of Eden Patera. The layers represent areas where lava in an ancient lava lake attached to ridges and hills in the floor of the crater, froze against the bedrock, and then detached as the lava lake drained from beneath. Image released Oct. 2, 2013. "If these things were impact craters, then they have experienced a lot of erosion," Michalski said. "That means they should be shallow … but these things are very deep, actually. They have a depth, which is something more like a pristine crater, but a pristine crater has all that stuff preserved. So, it doesn't make sense; it doesn't add up … They just don't look like impact craters." This image shows another candidate supervolcano on Mars, called Oxus Patera. The image was created by draping color images from the High Resolution Stereo Camera draped over digital elevation data from the same instrument. Image released Oct. 2, 2013. "I agree with the authors that if such [super]volcanoes have been widespread, disseminated and explosive, their findings are very important on the so-far-not-well-understood climate history and past habitability of Mars," Helmut Lammer, a senior scientist at the Space Research Institute at the Austrian Academy of Sciences who is not associated with the study, told SPACE.com in an email. "The importance in the study lies in the fact that our understanding on early Mars volcanism becomes better." Although these results are exciting, Michalski hopes that other scientists will follow up on his work. "We suspect there very well may be more of them [supervolcanoes], but we just haven't been looking for them," Michalski said.